Councilman Moses Holmes was most concerned. In June 1784, he wrote to the Connecticut Courant and Weekly Intelligencer, from his home in Willington, to complain about the 'quack' doctor roaming around his neighborhood. People were dying. That was true enough. But the cure prescribed by this immigrant medic was unorthodox to say the least. Holmes, with his own eyes, had witnessed several families acting upon encouragement to dig up the remains of their own deceased children. The grieving parents had been convinced that their surviving children were in danger, if they didn't perform grisly rituals. Their dead child would prey upon their families. It had become a vampire. 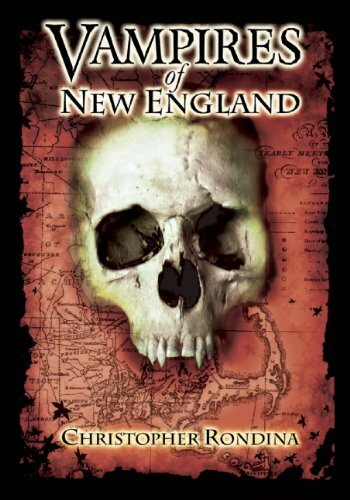 A chronicle of the investigations into historical vampires, who were supposed to have prowled in north-eastern USA. Some things you really don't expect to find, when you're out playing with your mates. In November 1990, a group of children were playing in the grounds of a sand and gravel company. Suddenly the ground gave way. None of the children were injured, but their shrieks were renewed, when they saw what they had uncovered. A human skeleton lay exposed by the crumbling soil. They naturally fled, seeking to alert an adult to their find. One boy took a skull with him. It was presented to his mother, when she didn't believe him. The authorities were called in the assumption that this was a murder scene. It was not. The site turned out to be a long-lost family burial plot, which had once lay in the grounds of the Walton farm, in Griswold, Connecticut. In all, twenty-nine people were buried there - six men, eight women and fifteen children or infants. They had all died during the late 18th and early 19th century. Each were now taken to Hopeville Cemetery and quietly re-interred out of the way. While the exhumations were, by their very nature, a little grisly, there was nothing much here to worry the police or the property's current owners. The skeletons afforded historical pathologists a glimpse into the health and death of rural people living at that time. That was all. Except for one. The remains of JB startled everyone concerned, and kick-started investigations into the vampires of New England, USA. JB: 55 - A Connecticut Vampire? JB's skeleton was just one of those found in the Griswold gravel pit. It stood out because of the position in which it was found! We know very little about JB and his life. We don't even fully know his name, beyond his initials, nor how he related to the Walton family. We do know that his life was either violent or involved some kind of risky activity. His skeleton revealed a mess of healed fractures, as well as several broken ribs. His knee had once been hit so hard that an area of bone (30mm in diameter) remained permanently crushed. JB would have been subject to a lot of aches and pains. Periostitis inflamed his joints, rendering them prone to swelling and increasingly painful to move. He also suffered from mild osteoarthritis in his back. All of this before the tuberculosis came, which took his life aged 55. But not everything was bad. There's a strong likelihood that the woman buried beside him was his wife. Her initials were IB. Unfortunately, she was only 45 when she died. They also had at least one child. Thirteen year old NB was laid to rest beside her parents. They all perished during the 1830s. Each of them was placed into a stone coffin. Tacks on the lid spelt out their initials and ages. That's how we know them. His read JB: 55. What was remarkable was what happened next. At some point after burial, JB's body was dug back up and mutilated. Those broken ribs, it turned out, had happened five years after death. Someone had smashed through after JB's heart. Moreover, the cranium had been very deliberately sliced from his head, presumably to remove his brain. His feet and shins remained in place, but the thigh bones were removed and crossed over his chest. His skull was placed on top. It looked like the device on the Jolly Roger flag, so beloved of pirates. But this was nothing to do with the ocean. JB was so arranged because someone somewhere thought that he was a vampire. The good folk of Connecticut, during the early 19th century, were just trying to protect themselves. The body of JB isn't with the rest of his kin, in the cemetery at Hopeville, Griswold. He alone was taken to the National Museum of Health and Medicine, in Washington D.C., where he still remains. This episode covered the Griswold Vampire story. 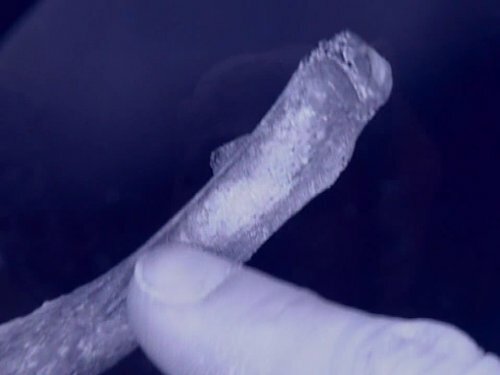 Modern forensics are employed to uncover the mysteries from JB's bones and grave. A generation after JB's grave was desecrated, a vampire panic swept through the locality again. On June 8th 1854, a terrible procession entered the graveyard at Jewett City, Griswold. Buried there was Horace Ray, who had died in 1846. He'd been followed quite quickly into the grave by his two adults sons, Lemuel and Elisha. They'd all died of tuberculosis. Now eight years later, the last surviving son was fading. Coughing up blood and gradually losing more energy every day, it's not hard to speculate that it was consumption which was taking him too. But the Ray family came from Griswold. The example of JB tells us what they considered to be the source of such symptoms - a vampire. The Norwich (Connecticut) Courier ran a newspaper report on what happened next. The Griswold men dug up the remains of the two Ray brothers. There was a pyre already prepared. The badly decomposing bodies were consigned to it. They were both burnt to ashes as suspected vampires. The report doesn't state what happened next. We can assume, from the Mercy Brown case, that the ashes were mixed into a paste and fed to the ailing Ray brother. Alternatively, the smoke from a vampire's funeral pyre was thought to be medicinal. He may have been conveyed there to immerse himself in it. We don't know if he survived. The likelihood is that he did not. However, that didn't stop a veritable vampire panic overwhelming Jewett City again in 1854. The Ray Brothers were only the first corpses exhumed. Several suspected vampires were removed from the ground to add to the funeral pyres, before the craze ran its course. The Norwich (Connecticut) Courier reported them all. The remedy, it was said, had worked before so many times, but only if it was done correctly. There had once been six sisters, now there was only one. We don't know her name, just that she lived in West Stafford, Connecticut; and like her sisters before, she'd contracted 'galloping' consumption. We also know what she did. On the advice of her neighbors, she did it to save her own life. She did it alone. It was now 1888, but the tuberculosis epidemic was still sweeping back and forth across New England. Often it took out whole families. It was barely understood, even by the doctors, who had little to prescribe to still the death toll. The unnamed woman stood at night between the graves of her five deceased sisters. Coughing up blood and wilting herself, she had built a small fire. It is to be imagined she had received some help in retrieving the items there to burn. The hearts and lungs of all her dead sisters lay in a pile ready for the flames. But as she burnt those decaying organs, one by one, she was quite alone. The ritual demanded that she had to be. And if she'd been accompanied, then would whichever sister turned out to have been the vampire be able to return once more from the grave? We do not know. We just know that the woman burnt those organs, then allowed herself to be completely fumigated by the smoke. It was in her hair, on her clothes, touching her skin and being breathed into her consumptive lungs. This was how they dealt with vampires in West Stafford, even sisters. Your round-trip ticket to the wildest, wackiest, most outrageous people, places, and things the Nutmeg State has to offer! I'd love to come with you to look around the vampire sites! Unfortunately, I'm on the wrong continent. My apologies for the delayed reaction, I've been on vacation and only just returned. I know the vampire crazy is huge. 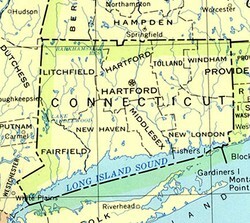 I would also like to visit Connecticut. It's believed that we've only just scraped the tip of the iceberg. It happened all over New England, with one case as far west as Minnesota. The feeling is that there would have been many, many more cases. But this happened mostly out of sight in rural communities, so there is no record. It would have gone much further in Connecticut. Jo, I live in Connecticut and never knew about this vampire craze. Thank you for writing about it. Do you know if the craze was only in the two towns mentioned or did it go further in Connecticut. I know what you mean about many vampire stories being ridiculously similar. They were all trying to reproduce Dracula ad nauseam at one point. It all gets much more interesting when other aspects are explored, like civil rights (True Blood), immortality (Vampire Chronicles) and half-human/half-vampire hybrids (Blade). I'm also enjoying chasing down the origins of some of our biggest mainstays. Most of it's Bram Stoker, but some have really surprising origins. Like Coleridge thinking that Wordsworth was a vampire. It's like bits like that which make all this research worth it. I currently have 24 vampire articles. I could write another 24 on top of that. I'm enjoying the journey. Thank you for writing it ^_^ and for the discussion! I'll be reading others. The only family for which I can answer with some certainty is that of the Brown family in Rhode Island. They were casually religious, as in not enough to undertake a very, very long walk each Sunday to go to chapel. Shortly before Mary died, she did take that journey. She was suffering so badly with TB, she thought it might help. It didn't. Their father later agreed for his wife's body, and his daughters Mary and Mercy's bodies, to be exhumed. But he personally didn't believe in vampires. His neighbours were so adamant that he gave in simply to appease them. Plus his son Edwin was dying and there was nothing he could do. Maybe a small part of him did hope that there was something in the vampire legend, and that he could save Edwin. Often these things happen because the families don't want to leave any stone unturned. If there's at least a chance to save a loved one, wouldn't you take it? As for the Somali TB sufferers, that sounds like it was a sensible way to approach the issues. I'd be interested in knowing what the families from your articles really believed about vampires. Were these people still pretty religious, like the groups that carried out the witch hunts in the US? In which case- what did they believe actually happened to their loved ones? Not just physically but spiritually as well. I'm pretty sure a big cohesive set of health education, and public health practices were put into play, as well as within hospitals just making sure to provide care as holistically as possible, to do what they could to reassure the patient and their families of their safety, and respecting their culture while still upholding their oaths as doctors. So, doing things such as bringing in religious elders or if the family wanted like a witch doctor of sorts, and doing everything they possibly could to break down communication barriers. I guess it really came about when you had Islamic converts, who particularly picked up the notion of an angry punishing god, without necessarily taking out the culture and religious history (which included things like magical practices, and voodoo). And otherwise I think it was case by case. I didn't know about any of that. It just shows how these concerns go on and on. It's only one step from 'being cursed' to 'being a vampire'. Thank you for sharing that with us. What did the ethic boards decide in the end? At least for the majority of cases? Ah, well I'm familiar with the fact that Somalians use witchcraft and/or witch doctors in medicine, and fully believe a person can be cursed and that there are very specific ways in which someone who has been cursed must be dealt with. TB is one of those for Somalians, and I believe the word they use for the illness either means possessed by evil spirits, and the other kind of expresses the idea that the person is deathly ill and will/must die alone. (If I remember correctly, might have to look that up.) They have a few specific medical practices for dealing with TB, but for the most part if it is believed the person became cursed by their own misdeed or disbelief then they could not, or should not, be cured and must suffer their punishment. It became an issue when the US started having Somalian refugee camps. If someone came down with TB, their families would try to communicate to western doctors that the person would die, while doctors are going 'no! no one should ever die of TB these days!' leaving the families terrified they were all about to be cursed themselves. Most often, the ill person themselves would refuse treatment, depending on exactly why they believed they were sick, but chances were it was because they felt they'd been cursed. In their eyes, the moment they became ill, they were already dead, in the eyes of their family and community, where they'd now never be welcomed back. It was their wish, because of religion, if you will, to go untreated. In the US, a patient has every right to refuse treatment... Unless an ethics board determines the person is unfit, mentally, emotionally, or otherwise, to make that decision. It became a huge ethical issue, which case by case ethics boards had to debate down the line on what the correct thing to do was- disrespect their culture and save a life, or grant the person and their family their wishes. One thing to keep in mind is that if the ethics boards were to help this person, they no had to follow it all the way down the line, he/she would be a refugee that would no longer be accepted back into their small community...could they be helped to integrate into Western life after being shunned by their community and refugee camp? Or would they end up killing themselves down the line regardless? It is an interesting debate.